Very interesting little video about Inventing the Future of Learning and the work of the Technology Enhanced Learning Research Programme . What I like most about it is the link to research, far too often missing from any discussion of educational technology. I also like the fact that it asks questions rather than simply asserting uncritically that technology in education is a good thing. Thanks to Joe Wilson @joecar for digging this one up..
[caption id="" align="alignnone" width="300" caption="Disrupting Class"] [/caption] Wearing my Futurelab Associate Director hat I was invited to speak at the CoSN Annual Conference in Washington DC earlier in the month. I picked up one of the big themes I have pursuing for a number of year - 'Technology Push v Learning Pull' [subject of subsequent post]. 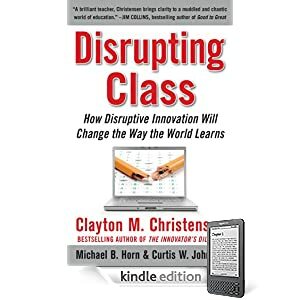 I was invited to have dinner at the conference with Curtis W Johnston one of the co-authors of 'Disrupting Class' and was impressed with the depth of his thinking on the. And the first thing the majority of them do.